Extech EX540 wireless datalogging digital multimeters from TRIO Test & Measurement have been selected as the 2010 EC&M Product of the Year Category Winner for the Portable Measurement Equipment (Multi-Function) category.Over 90 products across numerous categories were evaluated by a panel of six judges selected from their readership with a representative mix of electrical engineers, contractors, and plant facility personnel. Extech EX540 digital multimeters are the first handheld multimeters to offer wireless data streaming to a laptop or PC for datalogging or real-time monitoring. The new DMM multimeters are part of the EX500 series of industrial multimeters. These ruggedised, dustproof and waterproof multimeters can withstand a 6-foot drop, making it the ideal starting point for a go anywhere Digital Multimeter. The innovative new meter offers wireless connectivity to your laptop or PC using a USB receiver with a range comparable to Bluetooth (10m/33 ft). The EX540 transmits real-time data for monitoring, trending and analysis (using the included software) on one of two available frequencies (433 and 914 MHz). Electrical professionals can monitor and datalog readings at a safe distance from hazardous locations. Additionally, it is easier to perform remote tasks such as powering up a device from a control panel that is not nearby. 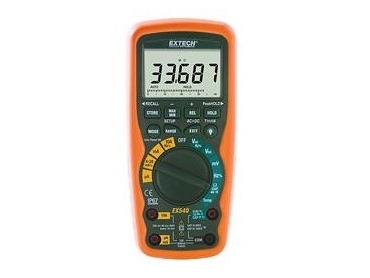 From a time-saving perspective for laptop users, EX540 digital multimeters permit a user to set up their laptop at a centralized location and then sequentially datalog readings throughout a site without relocating the laptop. Ruggedized to industrial duty specs, the new Extech digital multimeters True RMS Digital Multimeters that, in addition to wireless datalogging, can log up to 9,999 readings internally and also reads voltage, current, resistance, capacitance, frequency (with dual-range sensitivity for electrical and electronic work), duty cycle (dwell), continuity, diode testing (2.8V), and even temperature (using its Type K thermistor bead probe). The new meters feature a 0.06% accuracy and a Category IV overvoltage safety rating. Several one-button statistical data functions on the digital multimeters include minimum/maximum, relative, hold, and peak hold as well as selectable auto-ranging or manual-ranging. An analogue style bargraph also complements the EX540’s informative triple-reading display. The Extech EX540 wireless Datalogging Digital Multimeter comes complete with double-molded test leads, USB wireless receiver, temperature probe, magnetic hanging strap, 9V battery and carrying case.